This fourth grader is determined to make his dreams come true. From Hollywood star to astronaut, every kid thinks about what they want to be when they grow up. While some put aside these ambitions, other children are more determined to turn these dreams into reality. For 9-year-old New Jersey resident Jack Davis, going to the moon and fighting aliens is at the top of his to-do list -- and he's determined to make it happen. 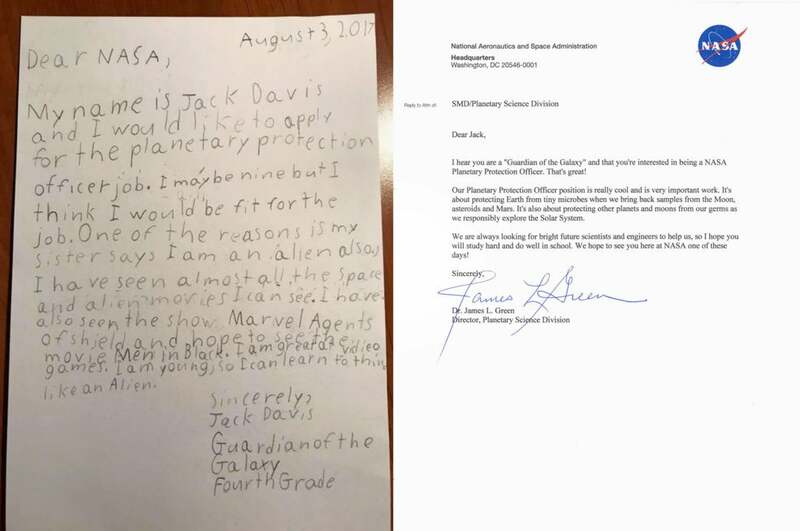 After NASA recently announced it's seeking a new "Planetary Protection Officer," Jack, a fourth grader, sent in an application. So what makes him qualified to join NASA? Well, for starters, he identifies himself as a "Guardian of the Galaxy." And according to his sister, he's an alien. Jack also says he's young, so he'll be able to learn to think like an alien. Jack also boasts that he's great at video games and has "seen almost all of the alien movies I can see." Unfortunately, the job requires a few more years of experience. However, that doesn't mean Jack should forget about his dreams altogether. Jonathan Rall, NASA's director of planetary research, gave Jack a call to congratulate him on his interest in the position, and NASA's Planetary Science Director Jim Green wrote back with an encouraging note, telling him to "study hard and do well in school."